The downtown Riverside canvas that houses our Encore campus gives our students the opportunity to take in their education in a collegiate atmosphere. Encore’s Riverside campus is an open campus. This means that students have the eclectic streets of downtown Riverside as their school quad. They have the opportunity to eat at many of the food establishments located on the pedestrian mall. This beautiful backdrop gives our students an advantage with opportunities for a full library, art museum, metropolitan museum and special events at the Fox Theater. Riverside is the City of Arts and Innovation and Encore is located within Riverside’s Arts Block. Encore has a ten-minute block between classes so students can walk on the approved paths within the 3/10 mile span between buildings. There are five buildings that currently make up the Riverside campus. This building serves as the main office on the third floor. The first floor serves as the school’s student union. Historically, this building was built in 1911 an was the site of Riverside First National Bank. 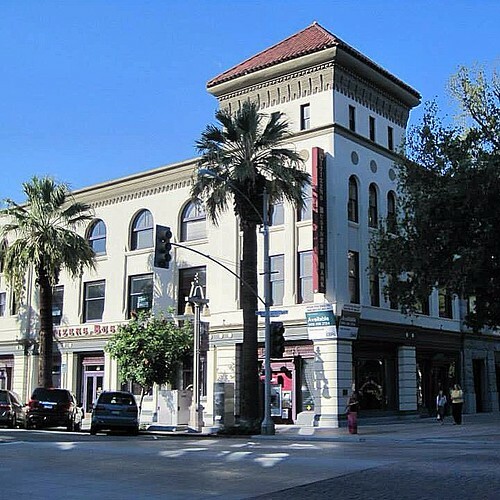 — Designed by architects John Parkinson (L.A. City Hall) and George Edwin Bergstrom (The Pentagon), the 4-story Italianate-styled bank building includes recessed windows and an elaborate cornice with decorative brackets and deep overhang. A 1958 remodel by Welton-Beckett for Security (Pacific) First National Bank added marble and Byzantine tile designs on the lower exterior. The remodel also added a thin sign marquee and projecting slab hoods over the entrances. The second floor of this historic building will serve as ten classrooms for junior high academic classes once construction is completed. Historically this building was built in 1903 — Designed by the Los Angeles firm of Burnham & Bliesner, the Italianate-styled building was named for President Theodore Roosevelt, who visited Riverside in 1903. The front façade is topped by an arcaded corbel cornice with decorative shell and flower designs. Eight windows on the second level and a continuous rectangular window with arched wooden dividers unify the building’s storefronts. This two story building houses multiple Encore arts classes, based largely around the music conservatory. Encore uses a second floor in this building for three separate classrooms. Historically, this building was built in 1890 — Designed by A.C. Willard and built by wealthy winter resident Charles Loring, the building is likely the oldest structure remaining on Main Street. It once served as Riverside’s first city hall, library, courts and even had a small jail. Originally designed in the Richardsonian Romanesque style, it was remodeled in 1918 by Riverside architect G. Stanley Wilson to better reflect the Mission Revival style of nearby buildings (particularly the Mission Inn). Inside, the building still contains an ornate “birdcage” elevator. For nearly 100 years, the city’s famed Loring Opera House (a.k.a. Golden State Theater) stood on Mission Inn Avenue adjacent to the Loring before being destroyed by fire in 1990 (and is now a small parking lot). This building houses Art classrooms for Encore and Tuesday evenings interest meetings. Encore Education Corporation strives to make sure that all stakeholders are properly served. Part of this promise of service is adopting a Universal Complaint Process. START HERE – Whenever there is an incident, concern, or complaint (whether you are a teacher, student, staff member, or other stakeholder) an incident report or a formal letter must be filed in the front office of the campus where the report is being made. All filings should start at the school level. Anonymous reports can be filed by placing an incident report in a sealed envelope and giving it to any staff member or dropping the sealed envelope into a staff box (A and F buildings) addressed to the person that should open the envelope. SITE INVESTIGATION – Once a complaint is filed, it needs to be investigated. Time Required – Investigations take time so it is important to be patient. Anyone reporting an incident should allow no less than seventy two (72) business hours to investigate a claim. Depending on the claim, investigations can take less or more than seventy two (72) business hours. Notification – If a person files a complaint directly to a Dean, they will be notified upon completion of the investigation. Anonymous complaints will be investigated and reported as logical. Confidentiality – If the investigation is protected by confidentiality laws for staff and/or students, outcomes of the investigation may be protected by law and you may not be allowed to know what the results and/or actions are coming out of the investigation. Results – If a complainant is unsatisfied with the investigation conducted at the site level, they can file a complaint directly to the Encore (District) Executive Office. EXECUTIVE (DISTRICT) COMPLAINTS – When a complainant is unsatisfied with the results from a site based investigation, they can file a complaint directly to the Executive Officer Team. Whenever there is an incident, concern, or complaint (whether you are a teacher, student, staff member, or other stakeholder) an incident report or a formal letter can be filed to the Executive Officers. If no prior complaint was filed at the site level, the Executive Office (District) can refer the investigation back to the site for investigation. Operations, Safety, Facilties, Discipline – These questions and concerns should be directed to the Chief Operation Officer (COO) Mr. John Griffin by contacting Executive Assistant Mrs. Ashlin Barkdull, 760-949-2036, abarkdull@encorehighschool.com, Encore Education Corporation, 16955 Lemon Street #A, Hesperia, CA 92345. Academics, Arts, Student Services, Policies – Questions and concerns relating to these topics should be directed to the Chief Executive Officer (CEO) Mrs. Denise Griffin by contacting Executive Assistant Mrs. Ashlin Barkdull, 760-949-2036, abarkdull@encorehighschool.com, Encore Education Corporation, 16955 Lemon Street #A, Hespria CA 92345. Enrollment, Media, Social Media, Events – Questions and concerns relating to these topics should be directed to the Chief Marketing Officer (CMO) Mr. Steve Dekany by contact Executive Assistant Mrs. Ashlin Barkdull, 760-949-2036, abarkdull@encorehighschool.com, Encore Education Corporation, 16955 Lemon Street #A, Hesperia, CA 92345. EXECUTIVE (DISTRICT) INVESTIGATION – Once a complaint is filed, it will be investigated. Time Required – Investigations take time so it is important to be patient. Anyone reporting an incident should allow no less than seven (7) business days to investigate a claim. Depending on the claim, investigations can take less or more than seven (7) business days to investigate a claim. Notification – If a person files a complaint directly to the District, they will be notified upon completion of the investigation. Anonymous complaints will be investigated and reported as logical. Results – If a complainant is unsatisfied with the investigation conducted at the District level, they can file a complaint directly to the Encore Board. ENCORE EDUCATION CORPORATION BOARD COMPLAINTS – When a complainant is unsatisfied with the results from an Executive (District) based investigation, they can file a complaint directly to the Encore Education Corporation Board. Whenever there is an incident, concern, or complaint (whether you are a teacher, student, staff member, or other stakeholder) an incident report or a formal letter can be filed to the Encore Education Corporation Board. If no prior complaint was filed at the site or Executive (District) level, the Board can refer the investigation back to the site or Executive Level for service and/or investigation. Filing – To file a complaint with the Encore Education Corporation Board, send a formal letter to the Board Clerk, Ms. Ashlin Barkdull at Encore Education Corporation, 16955 Lemon Street, Hesperia, CA 92345. Notification – If a person files a complaint directly to the Board, they will be notified upon completion of the investigation. Anonymous complaints will be investigated and reported as logical. Results – Results stemming from the Encore Education Corporation Board are binding to the fullest extent of the law. We try to make our academic teachers available face to face with parents every month. On the last Thursday of the month from 3:30 – 4;30 for most months (not December or May). The teachers will generally schedule the first 30 minutes with parents they wish to speak to. From 4:00 – 4:30 pm, the teachers accept walk ins. If you would like to try to schedule time, please email the teacher directly to see if they have a time slot available. In Riverside, Encore High School for the Arts is an open campus. There are several choices for lunch on the Pedestrian Mall within the approved path. On top of the access to restaurants, students also have the opportunity to purchase meals at the academic complex on Orange Street. These meals are prepared for Encore by Riverside Unified School District. These meals are for sale for $3.75 lunch and $2.75 for breakfast. Encore participates in the National School Lunch Program. 10:45 – 11:30 Junior High Lunch and 11:25 – 12:10 High School Lunch daily. Encore employs a health technician on both campuses that are on campus for the school day and many after school events. If your student has a medical condition or has ANY prescription drugs that they need to take during the school day, including asthma inhalers, there are forms in the health office that need to be filled out by the legal guardian. Possession of prescription drugs or over the counter medications on campus could result in immediate dismissal if all provisions are not met. When a student is ill or injured, they are referred to the health office. The health office is a place for first aid only. Our health technician will assess the situation and either the student back to class or call home. A student cannot remain in the health office for more than one hour before being sent back to class. In emergencies, the health office will call “911” and have students taken by paramedic to the closest available hospital. Every attempt to reach parents / emergency contact will be made when a student has a fever. Parents are expected to come pick up their student from school when they have a fever or vomiting. Any fever greater than 102.00 will result in a “911” call at the parent’s expense if parents / contacts cannot be reached. Students must be fever free for 24 hours without fever reducing medication before returning to school. Please make sure that your student has a current Emergency Card on file and contacts other than parents are listed. Students cannot be in the health office for more than one hour while waiting for parent pickup. Medication must be given to the school health office by the parent or guardian. Students are not allowed to transport medication to and from school. A written, signed statement from the physician giving the method, amount, and time when the medication is to be given. A written statement from the parent giving his / her consent that the school can give the medication as directed by the physician. All medicine must be in the container in which it was purchased. All medicine must be kept in the health office and will be dispensed by personnel. Send only the amount to be given at school and keep all other doses at home. If there is a change in the prescription, a new permission slip must be signed by the parent and physician. As part of California’s child health and wellness requirements, schools do periodic health screenings. In accordance with the screening practices of HUSD and RUSD, Encore will provide screenings for our students. Hearing & vision screening for all students in grades 8 and 10 will take place. Scoliosis screening will take place for all 7th grade girls and 8th grade boys. As public health nurses, the nurses conduct these screenings are trained to conduct these mandatory screenings in accordance with California state standards. Our health technician will assist them with all procedures and send home results as necessary. If a child fails a screening, a letter will be sent home to parent / guardian notifying them of the results. These results can then be taken to your health care provider for evaluation If you do not have health insurance, we encourage you to contact Encore’s health office for a list of low cost clinics in our area. If you wish that your child NOT BE SCREENED, please contact our health office prior to March 1. Otherwise, you student will be screened. If you have specific questions in regards to school health services. If we are unable to answer your questions, we will direct you to the county health department. Disclaimer – Your child’s school doe NOT provide medical insurance for your school accidents. This means that you are responsible for the medical bills if your child gets hurt during school activities. ALL ACCIDENTS OR INJURIES MUST BE REPORTED IMMEDIATELY. An incident report must be completed and can be obtained in the front office or health office. First aid may be administered on campus. All faculty and staff have completed both first aid and CPR training. Many members of the faculty have also een trained to administer EPI pen. If the situation warrants, paramedic services will be requested at a parent’s expense. In all cases, an attempt will be made to notify the parent or guardian as soon as possible. It is absolutely essential to have a properly completed emergency card on file at the school to ensure prompt and effective treatment and parental notification. For the convenience of our students and parents the Student Technology AUP can now be downloaded from the EncoreHighschool.com website then printed, completed and returned. Students and Parents must sign and permission given by marking the “I do give permission …” section of the contract. CLICK HERE to down the contract. Riverside Contracts are then returned to the 3rd floor reception. The Riverside campus is considered a commuter campus. This means that 90% plus of our student population has to find transportation to get to our campus. Encore understands the commitment needed to create a transportation plan for students before they drive. There are limited options when it comes to transportation. Parents can drive their students to campus while recognizing and following all drop-off and pick-up procedures outlined in the student handbook. Students can ride their bikes to school. In Riverside, there is a bike rack to lock student bikes located at the H Building on Orange Street. Students that possess a valid driver’s license can drive themselves to school. Downtown Riverside standard daily parking rates apply. There is limited free parking on Orange Avenue, but you can visit the parking authority on the corner of University and Market to get full details about parking downtown. There is a parent bulletin board posted in the main office (in the 3rd-floor office on University). Encore DOES NOT organize carpools for parents, but does give parents a place to share information to try to find a viable carpool. Riverside – the Metrolink and Downtown Riverside bus stops are within walking distance to downtown Riverside where the campus is located. Encore charters busing through Student Transportation of America for students at a semester charge. The cost for students to ride the bus is $200 per semester. Families wishing to have their students ride the bus must reserve their space by paying for a seat using our online service, SEAT YOURSELF. Families can also pay in person at the third floor office. There is limited space available on the bus program. Students are given space on a first come, first served basis. There is no guarantee that any student will be able to ride the bus. Encore does their best to accommodate all students, but in the event that the bus availability fills up, a waitlist for bus space will be created. The bus service is costly for Encore. The semester fee covers only about 40% of the overall cost of the bus service. We are sorry, but no refunds for bus service will be issued for any reason. Students misbehaving on the bus will be removed from this elective service without refund.